Bay Area native, Steve Hemmert, turned in two assault-style rifles to the Miami Police Department as part of their gun buy-back program on Mar. 17, three days after the Marjory Stoneman Douglas High School shooting in Parkland, Florida. 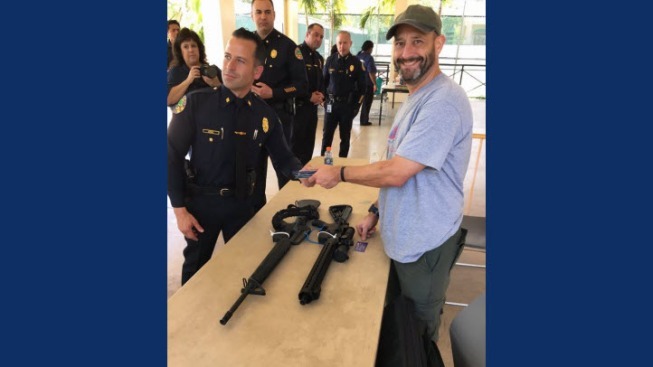 A Danville native has gained the attention of many on social media after turning in two assault-style rifles to the Miami Police Department as part of their gun buyback program on Mar. 17, three days after the Marjory Stoneman Douglas High School shooting in Parkland, Florida. Steve Hemmert, an attorney and a former U.S. Army Infantry Officer claimed there was no "need for any civilian to own an AR." He decided to turn in his firearms after his 14-year-old daughter told him that she planned to only wear sneakers to school in case she needs to run. The now Florida resident took to Facebook to share the news writing, "I realize that, unlike some of my neighbors, I am lucky to still HAVE a 14-year-old daughter. Enough is enough." His post has been shared over 91,000 times and has gotten over 147,000 likes. Hemmert claimed automatic rifles are not good self-defense weapons because they can’t safely be stored in a place where they can be used quickly. "I know very well that my little AR is never going to be used to stand up to a government that has tanks and heavy machine guns," Hemmert wrote. "And God forbid someone steals them and uses them to kill more innocents." He wrote that an "honest" gun owner would admit that the "only lawful reason to own an AR is because they are fun to shoot." And that his desire is that fun toys will no longer outweigh the value of the 17 lives that were taken down, "or the lives of countless other people whose lives have been taken by these toys — these weapons of war." Hemmert claimed in his post that the gun industry is pushing a dangerous product that has no benefit to society, comparing it to the cigarette industry. He claimed to now feel comfortable calling out the government to ban weapons of this kind and he hopes they require legal owners of automatic weapons to turn them in for compensation. "It may not get all of these guns out of the public's hands. But it will make it a hell of a lot harder for a deranged 19-year-old to get his hands on one," he wrote. "I want to be part of the solution. #neveragain."